When it comes to digital music, sometimes you want the compactness of MP3s, and sometimes you want the quality of CDs. Now, 4Media MP3 WAV Converter makes it easy to have both. This program is designed to convert between MP3 format and WAV format, you can convert WAV music file to MP3 format to reduce the file size by roughly a factor of 10 and vice versa, change MP3s to WAV format files for playback with CD quality. You can also convert other popular audio formats to MP3/WAV format like WMA, AAC, WAV, OGG, APE, M4A, MP2, AIFF, VQF and SUN AU and extract MP3/WAV audios from AVI, MPEG, MPG, MPEG-1, MPEG-2, MPEG-4, WMV, ASF, DAT videos. Besides the basic conversion function, 4Media MP3 WAV Converter also owns the capabilities to edit audios, like clip audio segments, split large audio into smaller pieces, add fabulous effects to customize the output, adjust a range of professional parameters to get better quality and so on. Packed with multi-threading and multi-core CPU technology, the program completes conversions in seconds and you can convert batches of files at a time to save effort. Convert WAV to MP3 format and preserve a high level of CD audio quality. Convert MP3 to CD quality WAV file format in fast speed to get better enjoyment in music. 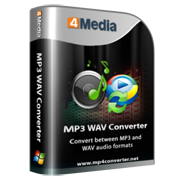 4Media MP3 WAV Converter enables you to extract MP3/WAV format audios from videos, including AVI, MPEG, MPG, MPEG-1, MPEG-2, MPEG-4, WMV, ASF, DAT formats. Convert a range of audios into MP3/WAV format: WMA, AAC, WAV, OGG, APE, M4A, MP2, AIFF, VQF, SUN AU. Surprisingly fast converting speed to accelerate the processing course due to the multi-threading and multi-core CPU technology. Support MP3 to WAV and WAV to MP3 batch processing to save you from tedious repeated operations. 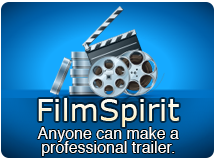 Clip as many segments as you like from the source and output them to separated files to keep interested parts. The practical splitting function helps you to split a large file into several smaller parts before output to perfectly fit the capacity of your device. Edit ID3 information for music files to distinguish them from others. This converter is not only a superb MP3 to WAV and WAV to MP3 converter but also a very fine MP3/WAV player. Set audio conversions to run at the background and save CPU resources for other applications.